NUMA-Q is a well-established IBM product in the very high-end UNIX market. 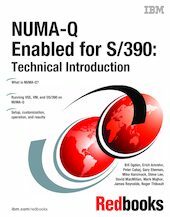 Using appropriate S/390 emulation software products, a NUMA-Q system can emulate a smaller S/390, including many of the I/O units associated with the S/390. This IBM Redbooks publication briefly introduces the NUMA-Q system, and then describes its use while using OS/390, VM/ESA, and VSE/ESA through such S/390 emulation.